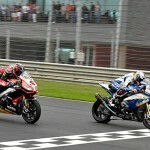 As expected, Aprilia has filed an appeal with the International Motorcycling Federation‘s International Disciplinary Court for the finish to the second race of the past weekend’s World Superbike Championship round at Italy’s Monza circuit. The race ended in controversy stemming from Kawasaki‘s Tom Sykes running wide on a corner and missing a chicane on the final lap. 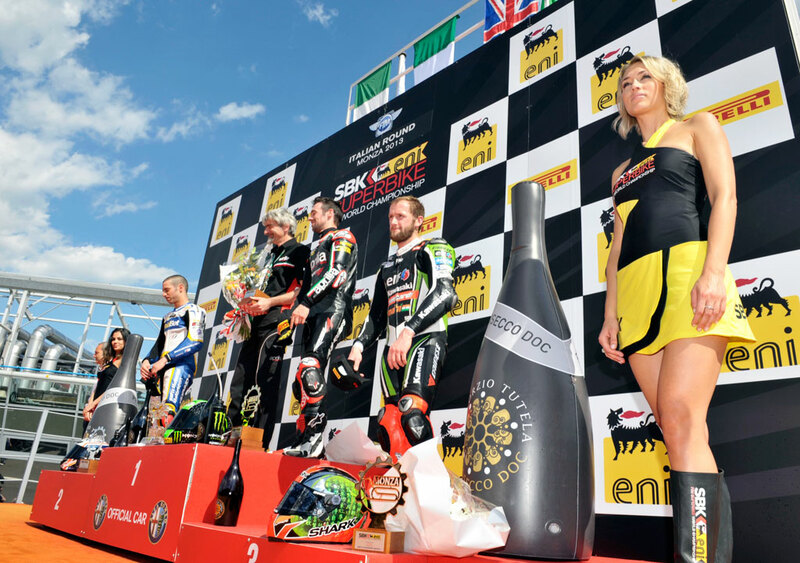 Sykes was in third place at the time ahead of Aprilia‘s Sylvian Guintoli, and was able to return to the track ahead of Guintoli, crossing the finish less than a second ahead of the Aprilia rider to take third place. After the race, Aprilia filed an appeal and race direction ruled Sykes should have ceded position because he gained an unfair advantage by cutting the chicane. Kawasaki later filed a their own appeal with the FIM’s Stewards Panel, arguing Sykes was already well ahead of Guintoli and only ran off track to avoid running into BMW Goldbet rider Marco Melandri. 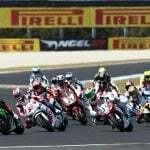 The Panel agreed, reversing Race Direction’s decision and restoring Sykes to third place. 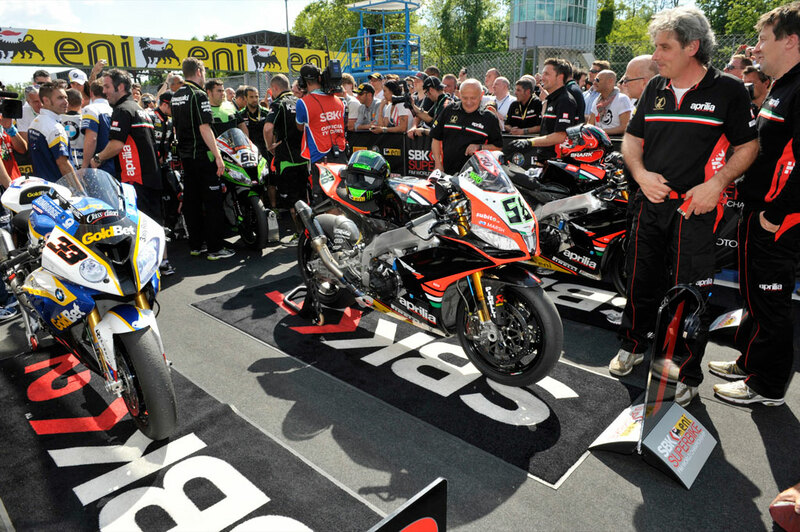 Parc Ferme after the second WSBK race. Note Sylvain Guintoli’s Aprila RSV4 in the rear at the right sitting in the spot reserved for third place. Tom Sykes’ Kawasaki Ninja ZX-10R is to the left behind it, about to replace Guintoli’s machine. 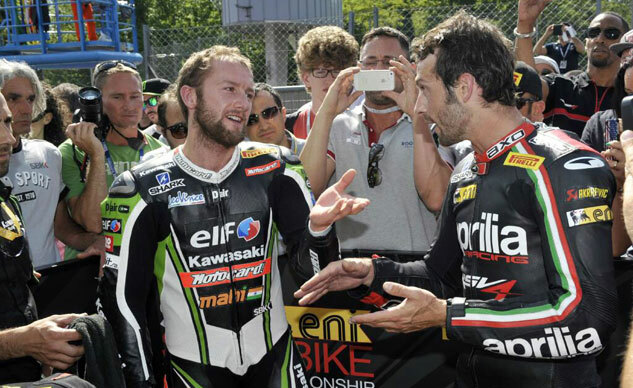 Aprilia has now filed an appeal with the International Disciplinary Court which will offer the final ruling on the matter. At contention are the three championship points that form the difference between finishing third or fourth in that race. 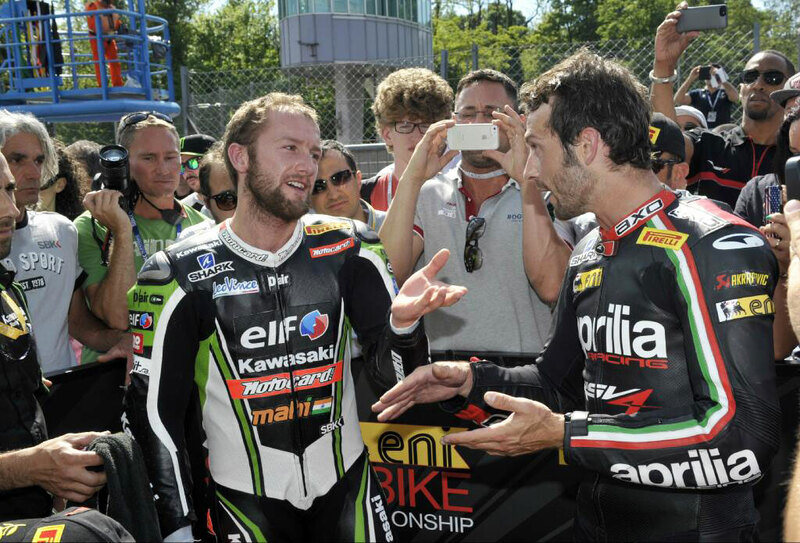 Both Guintoli and Sykes are among the title contenders with Guintoli currently sitting first overall with 137 points. His teammate Eugene Laverty is second at 124 while Sykes follows in third at 119 points. Should Aprilia win the appeal, Guintoli would be credited with 140 points while Sykes would be dropped down to 116 points. Sure, it’s only three points, but we only have to look to last season to see how valuable each point was. Max Biaggi won the 2012 WSBK title by a mere half a point; ironically, that half point came about because the series decided to award halve the values of the finishes for the second race of last year’s Monza round. 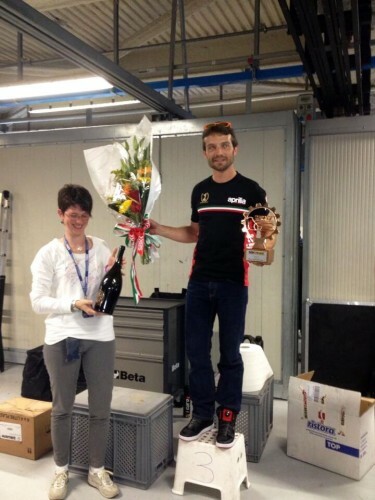 He also Tweeted a picture of his own private podium ceremony at Monza where he awarded himself third place.